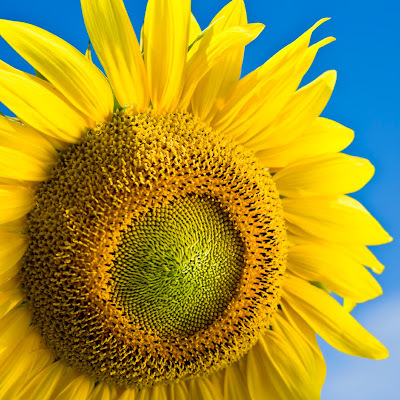 A new sunflower-inspired pattern increases concentrated solar efficiency. CAMBRIDGE, Mass. -- Just outside Seville, in the desert region of Andalucia, Spain, sits an oasis-like sight: a 100-meter-high pillar surrounded by rows of giant mirrors rippling outward. More than 600 of these mirrors, each the size of half a tennis court, track the sun throughout the day, concentrating its rays on the central tower, where the sun’s heat is converted to electricity — enough to power 6,000 homes. The sprawling site, named PS10, is among a handful of concentrated solar power (CSP) plants in the world, although that number is expected to grow. CSP proponents say the technology could potentially generate enough clean, renewable energy to power the entire United States, provided two factors are in ample supply: land and sunlight. Now researchers at MIT, in collaboration with RWTH Aachen University in Germany, have come up with a design that reduces the amount of land required to build a CSP plant, while increasing the amount of sunlight its mirrors collect. The researchers found that by rearranging the mirrors, or heliostats, in a pattern similar to the spirals on the face of a sunflower, they could reduce the pattern’s “footprint” by 20 percent and increase its potential energy generation. The sunflower-inspired pattern allows for a more compact layout, and minimizes heliostat shading and blocking by neighboring mirrors. The researchers published their results in the journal Solar Energy, and have recently filed for patent protection. At PS10 and other CSP plants in the world, mirrors are arranged around the central tower in concentric circles. The spacing between mirrors is similar to the seats in a movie theater, staggered so that every other row is aligned. However, this pattern results in higher-than-necessary shadowing and blocking throughout the day, reducing the reflection of light from mirrors to the tower. The MIT team looked to optimize the pattern to increase a plant’s overall efficiency. Alexander Mitsos, the Rockwell International Assistant Professor of Mechanical Engineering, and Corey Noone SM ‘11 collaborated with Manuel Torrilhon of RWTH Aachen, where Mitsos was a researcher prior to joining the MIT faculty. Mitsos’ lab developed a computational model to evaluate the efficiency of heliostat layouts. The model divides each mirror into discrete sections and calculates the amount of light each section reflects at any given moment. The researchers then tested the model on an existing commercial-scale CSP plant. Noone and Mitsos ran the dimensions of the mirrors from the PS10 plant through the model, determining the plant’s overall efficiency. The group found that the CSP plant experiences a significant amount of shading and blocking each day despite the staggered layout of its mirrors. To increase the plant’s theoretical efficiency, Noone and Mitsos tinkered with the pattern of heliostats, using numerical optimization to first bring the fanned-out layout closer together. This narrower layout, the model calculated, reduced the amount of land the mirrors took up by 10 percent without affecting the mirrors’ efficiency in reflecting light. The resulting pattern had some spiral elements similar to layouts in nature. So the MIT team, working with Torrilhon, looked to nature for inspiration — specifically, to the sunflower. The florets of a sunflower are arranged in a spiraling pattern, known as a Fermat spiral, that appears in many natural objects and has long fascinated mathematicians: The ancient Greeks even applied the patterns to buildings and other architectural structures. Mathematicians have found that each sunflower floret is turned at a “golden angle” — about 137 degrees — with respect to its neighboring floret.